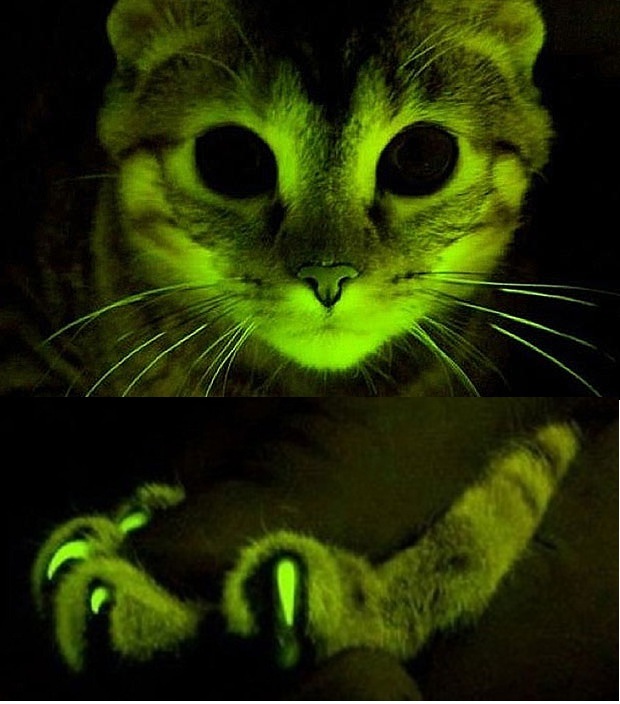 Scientists at the Mayo Clinic have inserted genes from fluorescent jellyfish into feline eggs prior to fertilization creating green glowing cats. The researchers were not doing this just to make the cats glow in the dark, they were also using the genetics of macaque monkeys in an attempt to learn how to ultimately stop both feline FIV and human HIV. The glowing traits were used to track the monkey genes and make sure that they were working. Tests on the cells of the glowing cats showed that they were indeed resistant to feline AIDS. This technology is being proved so that not only cats, but humans could fight off the deadly HIV virus. Macaque monkeys have certain proteins that can stop the viruses from invading immune cells, thus defeating both FIV in cats and HIV in humans. 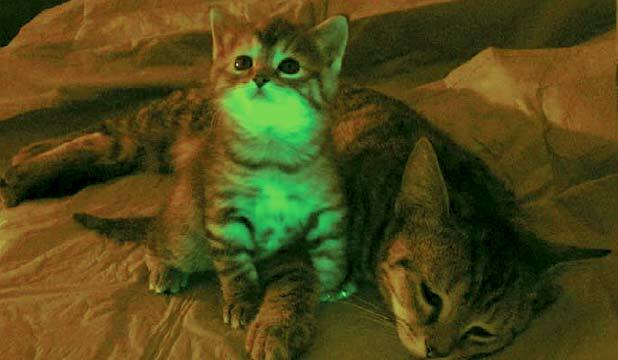 When the florescent cats had kittens of their own, they did transmit both the FIV resistance and the ability to glow in the presence of ultra-violet light. This glowing ability has been shown to work in dogs, mice, and monkeys when the jellyfish genes have been passed to the unfertilized egg of the animal through a harmless virus. This is being done to learn how restriction factors can be used to forward gene therapy for not only HIV but also for other viruses as well.